Sparklers, Noisemakers, Hats, Glasses, Poppers & more!!! Securely purchase tickets online through Tickets@DCGreeks.com! Part of the proceeds will be donated to Το Χαμόγελο του Παιδιού (The Smile of the Child). 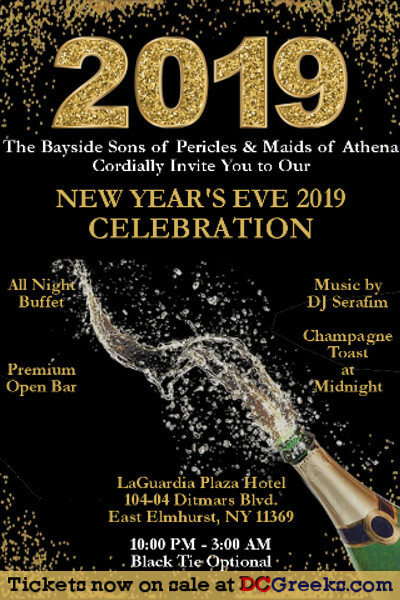 Discounted Hotel Rates available for $180/night on-site at the LaGuardia Plaza Hotel by booking online in the Maids of Athena and Sons of Pericles block or by calling (718) 457-6300. Heavy Hors d’ oeuvres, Champagne Toast at Midnight, Cash Bar, Party Favors, and so much more! PURCHASE EARLY, AS THIS EVENT WILL SELL OUT!